Please understand that BibleTimelines.com is NOT about a specific denomination, nor is it meant to be controversial. The Bible itself cannot be improved on, and no matter how much you think you know about it there is still much to learn from it. This website is designed to encourage you as you read your Bible, but it in no way covers all the topics in the Bible, nor does it exhaust each topic covered. Please, never stop reading your Bible! It is God's letter to YOU telling you just how much He loves you. He is telling you what He has already done for you, what He is doing right now, and what His plans are for you in the near future because you are loved! 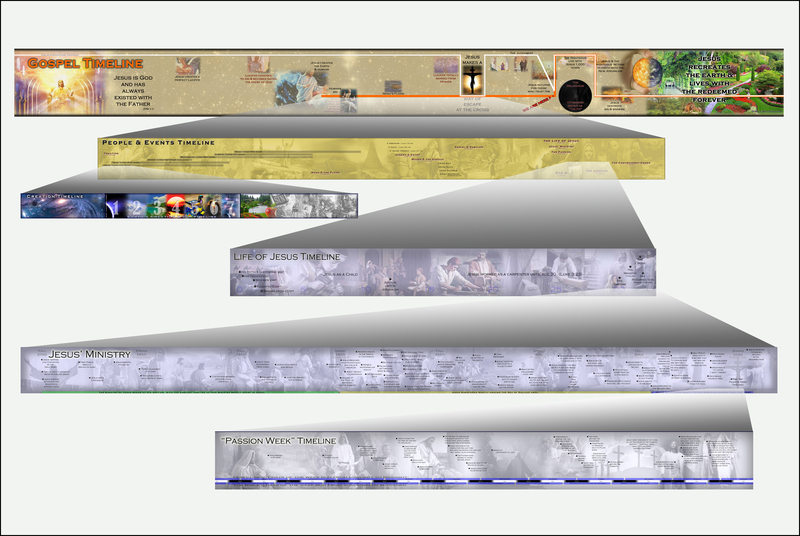 BibleTimelines.com contains a series of over 20 free and related timelines as illustrated above. (All are free to download and print.) There are also short videos and articles that get right to the point, plus posters, postcards, books and bookmarks, all dedicated to illustrating the details of the Gospel of Jesus Christ & His love for us. BibleTimelines.com was designed to allow you to understand more while reading less. BibleTimelines.com is attempting to help sort and arrange your Bible's bits and pieces of information about the Gospel of Jesus into a more understandable picture. You should be able to learn more, and understand your Bible faster by using BibleTimelines.com. BibleTimelines.com attempts to get at the deep meaning of the Bible and its stories, but does not attempt to give a lot of dates because, for the most part, truth is not dependent on precise dates. Exceptions would include where Bible prophecy specifies a date, and of course when that applies the dates are shown. A good example can be seen on the Daniel 8 & 9 Timeline. Have you ever wondered what God's love is all about? What specifically is the Gospel? How can I know that God is even real? What is "grace", specifically what is "God's grace"? What is the difference between justice, mercy and grace? Why are we here, where did we come from, and where are we going? Will this hate, pain, and suffering ever end? BibleTimelines.com is attempting to answer those and many other questions by sharing what has been learned about God, His love and His grace as seen in the Gospel. There's even a Gospel bookmark with the major events of the entire Gospel on one side and is ready for your advertisement on the other side (business, church?). This bookmark was created to allow you to quickly and easily see and share the big picture of the Gospel Story. These timelines/charts are attempting to place events in their correct sequence and show why things happened the way they did. They show what God has already done for us. Prophecy is "history written in advance". These timelines are showing a few prophecies in timeline format. They show a little of what God will do for us. These timelines are attempting to show a few very important principles in timeline format, thereby giving us a better picture of who God is and what He's like. These also show us some of why God does what He does. These topics are attempting to answer tough questions like: "Is God for real? "; "Is Jesus for real? "; "Why is there so much suffering? "; "How can I find the truth? "; "Have I committed the unpardonable sin? "; "Am I predestined, preprogramed to act like I do? "; "What is Grace? ", plus many others. This is a category that was created just so that all of the available videos could be found in one place. When Jesus came to this earth His purpose was to show us what God the Father was like. Everything Jesus taught, everything He did was for that purpose. Think of it as similar to the way we study the sun. If the sun were right next to us it would totally destroy us, but life is made possible because it is where it is and so we study it by observing what it does from where it's at. The more we focus on what our sun does the more we learn about the sun itself. In like manner, the more we focus on Jesus the more we learn what both Jesus and the Father are like. Because we know that when we love someone we want the absolute best for them then we can also know that because God loves us He wants the absolute best for us. Sin hurts everything and everyone it touches and this is why God must destroy sin completely. He loves us that much! God is always thinking about our happiness and our well being in everything He does and in everything He asks of us. Jeremiah 29:11 In fact, Jesus came to earth so that we might have life and have more of it, not just after we get to heaven, but also right now. John 10:10 What this means is that God wants you to be really happy, even beyond your wildest dreams, and because of this you can trust Him completely! God has promised, "And ye shall seek me, and find [me], when ye shall search for me with all your heart." Jeremiah 29:13 The more we learn about God, the more we will appreciate His love, and so this site is dedicated to sharing lessons learned about God and about His love for us.